Disclosure: This post is sponsored by Hasbro. All thoughts and opinions are always my own. My husband has been a Transformers fan since he was a kid. He collected all the toys when he was young and now that he has a son, he has introduced Transformers to him. This holiday season, Hasbro has a large new line of Transformers toys. Here are some of my favourite toys inspired by the new Bumblebee movie. 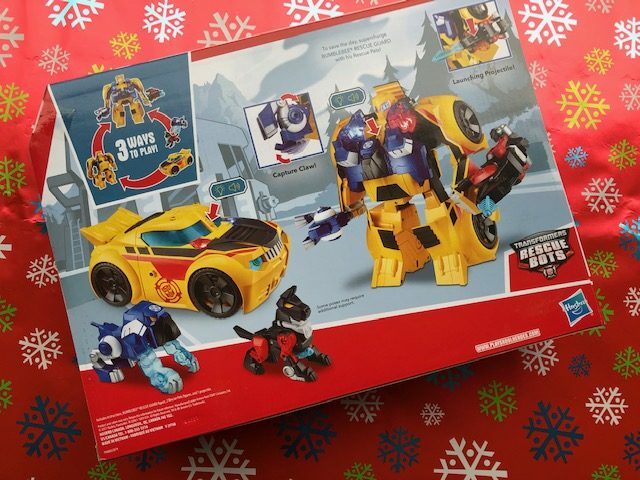 This Playskool Heroes Transformers Bumblebee toy allows young kids to transform Bumblebee from vehicle to bot in just one step and from bot to vehicle in two steps! Kids can play with Bumblebee when he’s in vehicle mode or they can play with him as a bot (measuring 10 inches high!). 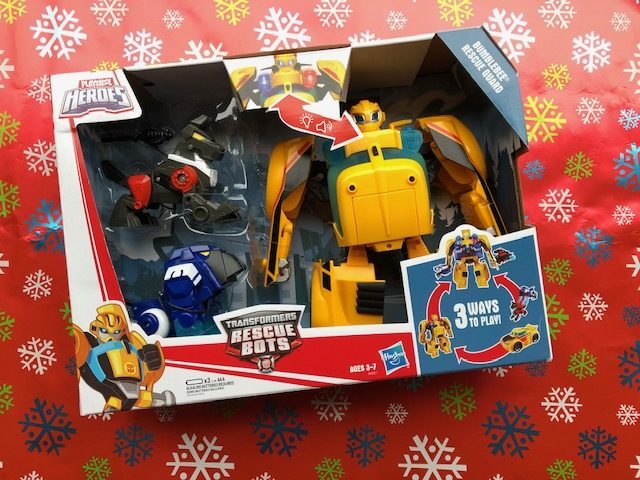 Bumblebee comes with two rescue pets, Sergeant Slobber and Growl the K-9 Bot. The rescue bots can also transform. Bumblebee makes sounds and has a working launcher. This toy is recommended for ages 3-7. The Transformers Power Charge Bumblebee figure is the ultimate toy for any Bumblebee fan. 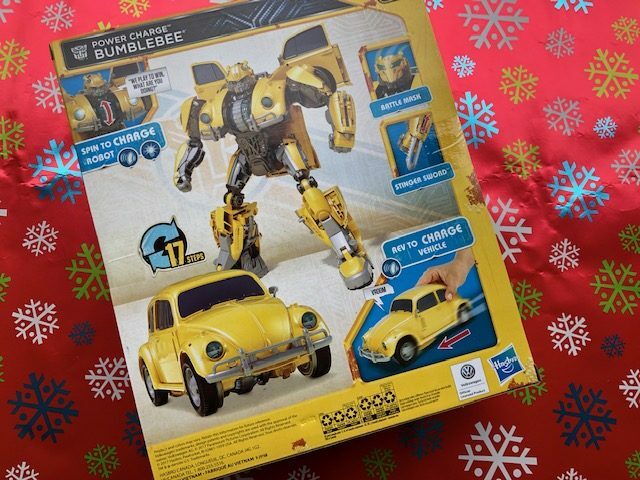 Convert Bumblebee from his original yellow Volkswagen Beetle car mode to bot mode in 17 steps. Rev up the car to hear over 25 sounds and phrases. Lower Bumblebee’s battle mask and then reveal the signature Stinger Sword! This toy is recommended for ages 6 and up. 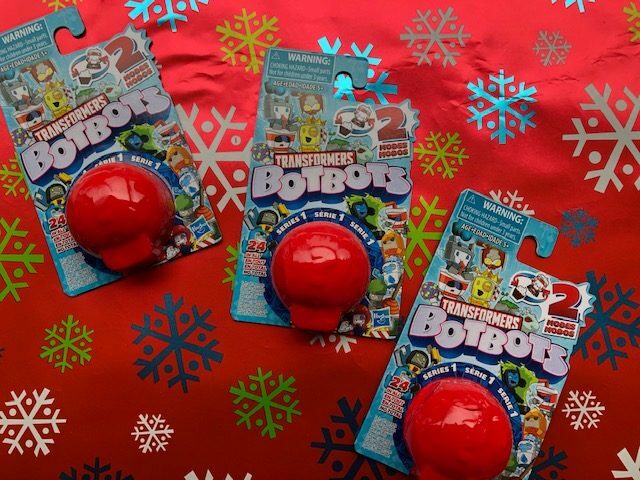 Transformers fans will love these new Botbots blind bags in their stocking! Every BotBots package comes with one mystery bot that measures 1-inch tall. They transform from regular items to bots in 3-5 steps. Instructions on how to transform them are included in every package. There are 61 characters available in series 1. Botbots are recommended for children 5 and up. These Transformers toys are available in stores and online now. Do you know someone that would love them? 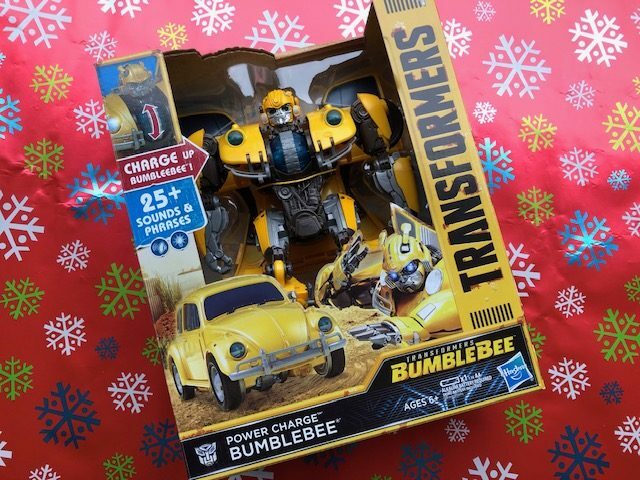 Hasbro is giving away a Transformers Power Charge Bumblebee Figure to one of my lucky readers. To enter, leave a comment telling me which Transformers character is your favourite and why. Then fill out the Rafflecopter form below. Giveaway open to Canadian residents only. Mandatory question must be answered to be eligible to win. Giveaway runs from Dec 20 – Dec 30, 2018. Void where prohibited. See my Terms & Conditions for full giveaway info. The Transformers are so cool. Bumblebee is our favourite. Optimus Prime because is the transformer in the lead. Optimus Prime is my favourite. He always has good leadership. I love Bumblebee because of his colour and he transform into a car. We are fans of Bumblebee for his fun colour and because he speaks through a radio. We like Optimus Prime because he looks cool then transforms into an awesome truck. Bumblebee is the family favorite! I like Optimus Prime because he’s the leader of them all! Bumblebee is so realistic and has such human reactions that I like him the most. I like Optimus Prime because he stands up for justice. Optimus Prime has always been my favorite because he always saves the day! My son really like Optimus Prime and Bumblebee!! He’s just crazy about transformers period!! Optimus Prime has always been my favorite because he is a real leader. I like Optimus Prime as hes a good leader! I have always liked bumblebee. Great prize. I love this movie series. Bumblebee is my favourite because is a lot of fun. 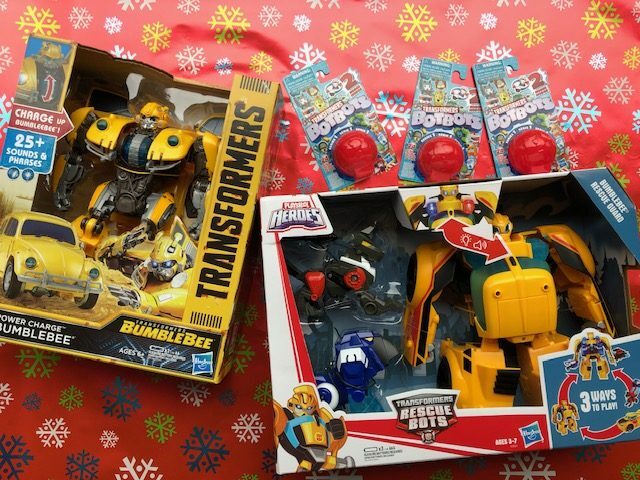 My little grandson will squeal with delight if I win him a transformer, especially the Bumblebee that turns into a car.He is four and a half years old an has already got a big interest in them. Bumblebee is my favorite because my kids love him. I love Optimus Prime. He is fierce and never gives up. I like Bumblebee because he goes from robot to a Volkswagon. We used to drive one and it was a fun little car and the character Bumblebee is fun and fits with the car. Bumblebee of course! He was always my favourite Transformer when I was a kid! My boys love Bumblebee because he’s got a great personality and is so positive! I like a couple of other ladies, really can’t pick a favourite because I don’t know a lot about them, but Bumblebee seems to interest me! My favorite is Bumblebee. I am stoked about his movie. I fell in love with his character when they used the radio as his voice, but I also liked him as a kid because he had an easy name to remember. boombox he is an old 80’s one. i loved that it transformed into a working boombox and he was so funny. The Bumblebee because he is kind. Optimus Prime is my favourite because he is such a great leader. We love Bumblebee because of its boldness and coolness. I love transformers and Bumble Bee. He is a sweet gentle machine. I have always liked Bumblebee since he first came out due to him being the underdog, small but such a big heart but showed such great bravery. It was and is still my sons favourite too! My Grandson has seen the trailer for Bumblebee so it going crazy about it! Bumble was my first transformer! So he is my favourite! 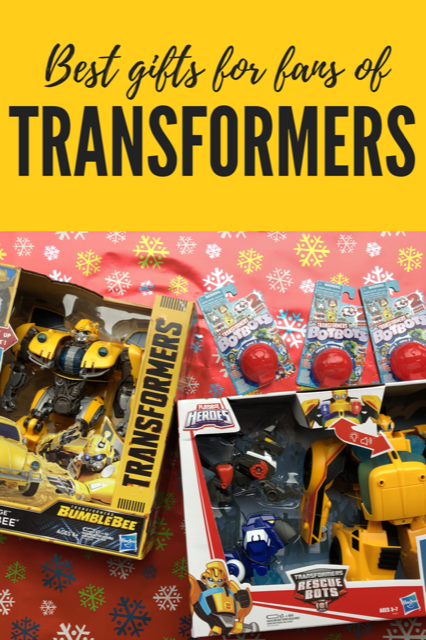 Oh Bumblebee is a favourite in our house, my young ones love rescue bots, and my older boy loves transformers. Optimus Prime, because he is so heroic! Don’t know much about transformers but Bumblebee seems very cool! My son is a huge Bumblebee fan so Bumblebee is moms choice as well! Bumblebee is my fav Transformer Character because he’s loveable in-spite of all of the trouble that he causes. my son is in love with hound. he loves all the snirky comments that he has in the movies. These would be such fun gifts to give.